Figure 2-29. Effect of Barrel Return Spring on Barrel Motion After Acceleration. bv the fact that the barrel travel curve is a horizontal line after 0.132 second. The data from fig. 2-29 are used to extend the barrel motion curves on the graph (fig. 2-30) showing the motion curvcs for the complete cycle. 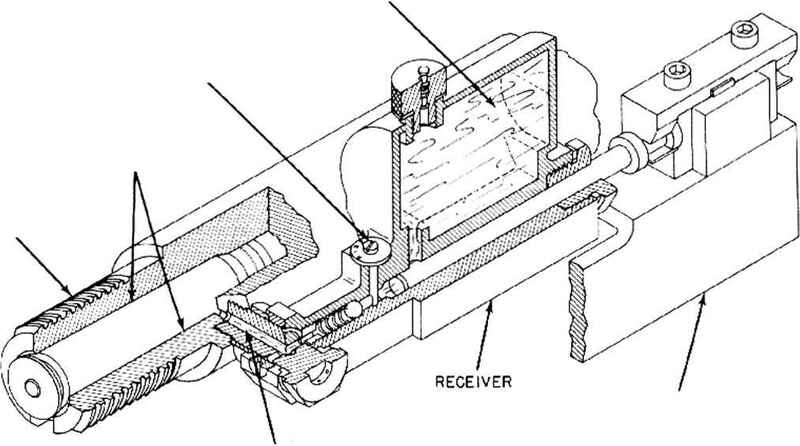 At the end of the acceleration period, the bolt is moving with a velocity of 60 feet per second and its motion from this point on is resisted only by the bolt driving spring. As shown on fig. 2 30, the barrel is latched at a displacement of 0.156 foot (1.875 inches). Since it has been assumed that the opening between the barrel and bolt must be 10 inches in order to permit feeding, the bolt must travel a total of 11.9 inches (0.993 foot) before it is stopped by the backplate buffer. Fig. 2-27 shows that the bolt travel at the end of the acceleration period is 0.280 foot and the bolt must travel an additional 0.173 foot.